GARGOYLES (1972) starring Cornel Wilde, Jennifer Salt and Bernie Casey. 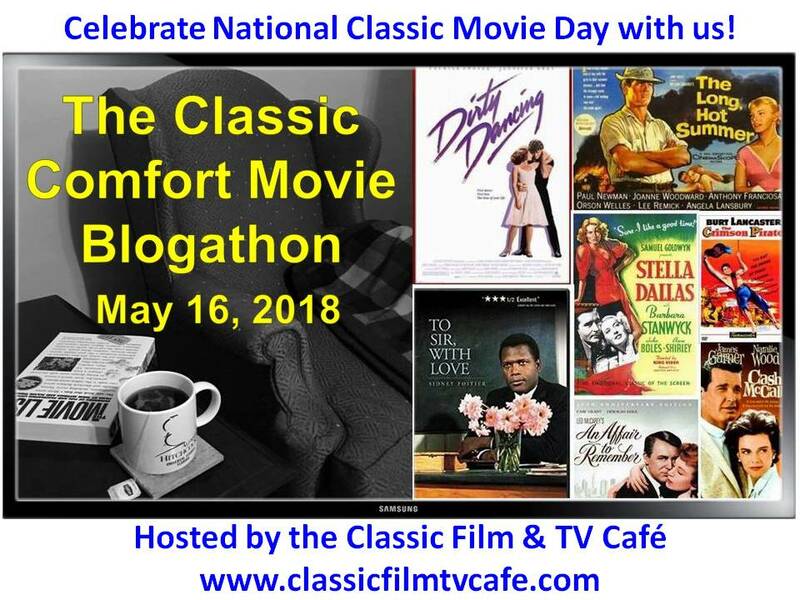 Rick's Classic Film and TV Cafe is a very enticing movie and television oriented blog where those of us in the know go for pertinent and impertinent (as the case may be) vintage film and TV information of the most intriguing kind. Rick's enthusiasm is genuine and catching and there's little he doesn't know about early television and films. 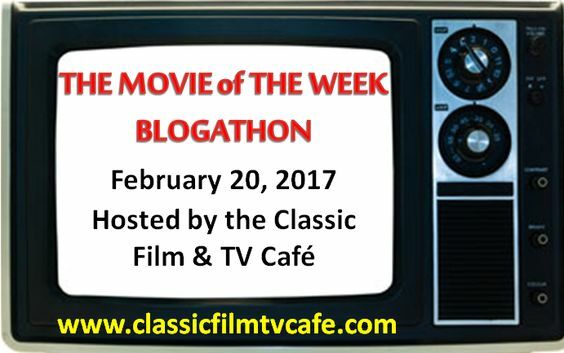 So when he announced a Blogathon of classic mid 1960's - 1989 TV Movies of the Week – I wanted to be a part of it. I begged, I pleaded, he said okay and here we are. 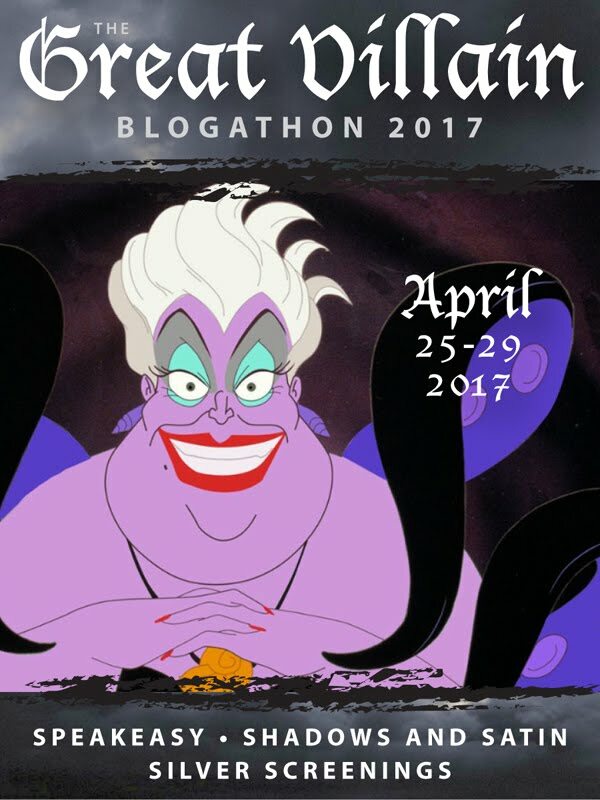 GARGOYLES (1972) is my Blogathon entry and boy did I pick a humdinger to exemplify the classic 'movie of the week' style back then. It's entirely possible that I chose this because it's the only movie I remember from way back then, but that's another story for another day. Salt is a baby-voiced, would-be journalist in a fetching 1970 'hippie' ensemble - flowing pants, beads and skimpy halter. No wonder she captivates a certain horned and lurking apparition of which more shall be revealed shortly. Heading out from the airport, Dr. Boley and his daughter stop at an eccentric old geezer's road-side 'museum' to check out some promised rare specimens. Unwisely lingering until the sun goes down, they are promptly attacked by unseen creatures in the night - the 'museum' goes up in flames and so does the old geezer. But not before he'd shown Dr. Boley his prize possession, a giant skeleton of an upright humanoid animal with bat-like wings and horns. Uh-oh. Father and daughter make a tentative escape in their station-wagon as out of the noisome night something large drops onto the roof of their car. That ‘something large’ is a reptilian, scaly-skinned creature who causes the winsome Miss Boley to emit ear-splitting screeches. This attack is very vividly done, considering the low budget propensities of these sorts of movies and no computer gadgetry. Just great costume, make-up, camera work and stunt tenacity. Was it scary? Yes. But wait, it gets better. Somehow the much put-upon car makes it to a local gas station in the middle of nowhere - this whole film takes place in as gloomy and desolate a desert town as hasn't been seen since the height of 1950's monster movies. Remember THEM? You get the idea. The gas station is within walking distance of a convenient motel and oh, by the way, the nearby lonely police station. Anyway, once Dr. Boley, the daughter, the sheriff and his deputy head out to investigate the museum crime scene, they run into some dirt bikers - one of whom is a young and lanky Scott Glenn in a very early role. The sheriff is eager to close the case so he pounces on the dirt-bikers as likely culprits. Boley and Diana haven't mentioned the 'monsters in the night' thing going on because Boley says they have no real proof - yet. 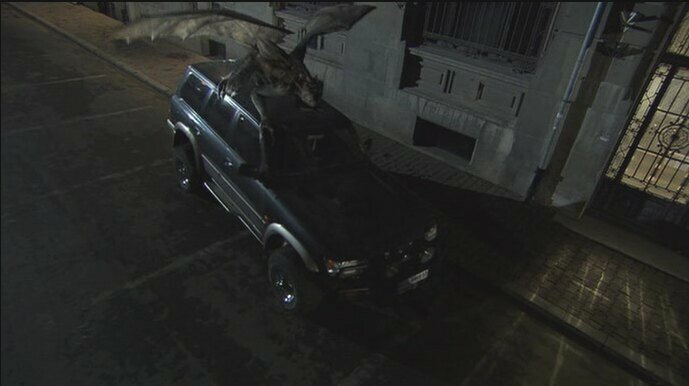 (How about some giant claw marks on the roof of the car?) He is foolishly hoping to keep things quiet until he gets his book written. Yeah, right, that's gonna' work. Well, one scary thing leads to another and before you know it, Diana has been spirited away by the king of the gargoyles played rather effectively (with some ferocious make-up) by Bernie Casey. The king is quite taken with the nubile young human with gold hoop earrings and white halter top. (So it wasn't only my brother who lusted after Jennifer Salt back in the day.) Since as explained by the king, gargoyles have been around for thousands of years and they only show up to procreate every few hundred or so years, they have to make optimum use of the time they're allotted. There is something about the king as played by Bernie Casey, which, after a while humanizes him to the point where you can almost see his point of view. He cannot help who and what he is, he cannot help wanting the survival of his species at all costs. And there is something confoundingly alluring (in a decidedly repellent way) in the unknown, the hideous and mysterious, the idea of winged humanoid creatures. Or maybe it's just Bernie Casey's mesmerizing voice which is so attractive. At any rate, the gargoyle king drops his captive back at the cave in the hills where the other gargoyles reside. And as these things usually go, a jealous female gargoyle (with more bird-like feathers than the male) instantly catches on that human-girl might be competition. "You must teach me, Diana," says the king. Her father's books have turned up in the cave (I think some of the wingless gargoyle youngsters earlier took them from the motel room or maybe the car), books whose contents the king needs to understand in order to save his species from annihilation. Hey, I don’t know, that’s the explanation. There are lots and lots of scenes showing Diana in her halter top. The gargoyle egg nursery - incubation time: 400 - 500 years. In the meantime, while Diana is learning about gargoyle sociology, the dirt-bikers, the sheriff, the deputy and Dr. Boyle are busy fending off attacks out in the desert as they get closer to the caves. Boyle will eventually be helped in his endeavor to save his daughter by - you guessed it - the jealous female of the species who is apparently the gargoyle king's mate. In the end, the doctor decides the eggs must all be destroyed (there are tens of thousands) to save mankind. In the resulting melee, the king and his consort, exhausted and wounded, are allowed to fly away into the night. What happens next? You'll have to wait another 400 to 500 years to find out. Despite the desperately low budget, lackluster dialogue, wooden acting (except from Bernie Casey who is marvelous) the film is a hoot and does have its creepy moments. You will definitely need some popcorn to wile away the dull stretches - mostly shots of cars driving on deserted highways - and also because movie monsters and popcorn just naturally go together. I can't quite tell you why I have such lasting (and perhaps idiotic) regard for this movie, but I do. With all its faults and banality of acting, I still remember it fondly. Maybe I just watched it at the right moment in my life, or maybe I just like gargoyles or maybe the whole idea of such creatures in hiding alongside us sparked my imagination. I was never big on 'movies of the week' but this one remains fixed in memory and that's why I didn't mind sharing my enthusiasm and hopefully most of you won't remember the last time I talked about it and we'll just make believe it didn't happen. Thank you Rick, for allowing me the opportunity to talk yet again about a movie that for whatever reason, remains tucked away in my memory of a time when I was a young mother (my daughter was two) and color television was just becoming the 'norm' - 1972, the year this movie was televised, was also the first year in which color televisions outnumbered black and white sets in the U.S.
Be sure and link to Rick's Classic Film and TV Cafe to see what other Movies of the Week other movie loving bloggers are talking about today. 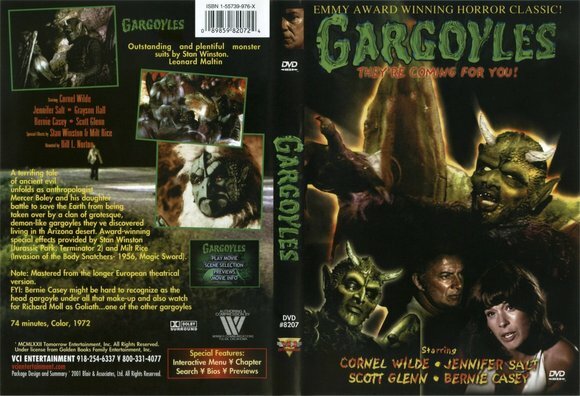 And as an added treat: link here, to watch GARGOYLES on youtube. Wow. What a fun topic. I love your enthusiasm for Gargoyles. We all have that sort of thing and we should proudly wave whatever title is on the banner. My favourite TV show when my daughter was born was the 90s reboot of Dark Shadows. When I think of that movie it is all mixed up with living with a baby for the first time. That's just the way it goes. That takes me way back. So far back, that only the photo of the gargoyle king is familiar. Marvelous makeup job. I don't like to watch films on my computer--just not comfortable enough. I found it on Netflix and put it in my queue. I'm not crazy about watching movies on my computer either, Fred. But since I no longer have a TV, needs must. :) My brother says PRETEND IT'S A TV FOR GOODNESS' SAKE!! But it isn't. I use my TV solely for watching DVDs. If a TV show looks interesting, I just wait for it to show up on DVDs at either Netflix or the public library, sometimes both. I like to watch films and I've discovered The Teaching Company which has a great catalogue of lectures on just about anything one can imagine on DVD, so I had to invest in a TV set. Otherwise, I just couldn't view them. Yes, I understand. We each have our own priorities. One of my favorite made-for-TV movies! I love how the gargoyles look very human-like as they cuddle their newly-hatched babies. Except for their leader, they don't look or act evil. For a brief part of the film, these lizard-like creatures come across as misunderstood victims. 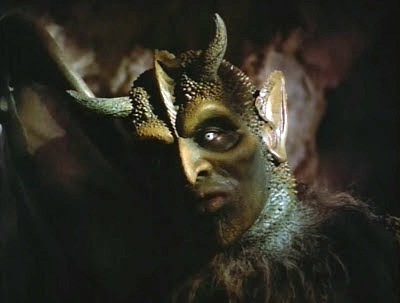 It's only when the head gargoyle threatens Boley that we realize these creatures are indeed mankind's enemies. I agree that Bernie Casey gives the best performance. I love the scene at the motel. You did justice to a made-for-TV classic! I remember the horrifying scene of the gargoyle landing on the roof of the car while the lead characters were out driving one night. That would have left me mortified! 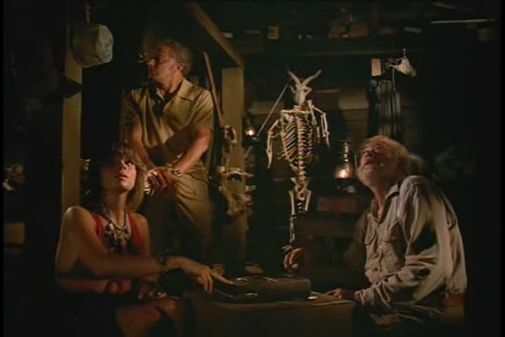 I think what I like especially about the film is how it segues between the hokey, like the things in Uncle Willie's place, and the questionable but realistic-looking, like the caves housing impeccably made-up gargoyles. "Gargoyles" truly deserved its Emmy for best make-up. Well done, Yvette! P.S. the print on youtube is a good one for a change. You're welcome, I hope you get a chance to watch it. I still remember this one! Gargoyles came from the era of memorable horror and scary movies made-for-TV: Trilogy of Terror, The Night Stalker, Don't Be Afraid of the Dark, Dying Room Only, Moon of the Wolf, Winter Kill, Duel, Crowhaven Farm, Harvest Home, Satan's School for Girls... I could go on and make this list take up several column inches. I remember them all vividly, but I guess I've always had a love for the lurid. Yvette, I love watching such films — don't ask me why! But they're classics too. Thanks for sharing the link. You're welcome, Prashant. I hope you get a chance to watch this. I think you'll really like it. Sounds like a lot of fun! I had a top similar to Diana's when I was a teenager! Oh to be young again! I don't think I'd want to be that young again, Peggy Ann. I'm not all that crazy about being old, but not sure I'd want to go back. :) Unless I could go back and still have all the life knowledge I have now. Oh, too scary for me. I'm a chicken on scary monster movies, stay away. But, I did catch a real classic a few weeks ago on TV on PBS -- "Laura." This is my third viewing and it's still fresh to me. I watched Vincent Price more closely, as you recommended once on your blog. But who can fail to love Gene Tierney in the role of Laura? She's irresistable. Now I'm combing through the library's collection of her movies, finding some classic noir films. And how can you be without a TV? No MSNBC? Then again, less aggravation watching a certain clique in office and their pals. But I do watch and when I'm sick of all of it, I watch a movie or pick up a book. Have seen some recent good dvd's from Netflix. There are some good sales going on with TV's, so you probably don't have to spend much of that hard-earned cash. Oh, I could get a TV if I really REALLY wanted one, Kathy. I suspect that I don't really care one way or the other. I've gotten used to NOT watching shows and stuff - anything else I can catch up online. I looked around my small apartment and couldn't figure out where exactly I'd place a TV. Everything is just to my liking now and I'd hate to have to move my stuff around. Not to say that in the future I might not change my mind. Who knows? I love LAURA as well. Fabulous movie. I never get tired of watching it. Any other Gene Tierney movies that you can suggest? I found some at the library, old noirs, but have n oidea if they're good ones or not. I suppose by not having a TV, you are protecting yourself from some of the worst shenanigans going on in Washington. Sometimes I want to be an ostrich with my head in the sand. Now they want to take away health care. People are protesting, but more voices need to be heard. Besides LAURA, I recommend THE GHOST AND MRS. MUIR (I also recommend the book - you will love both. ), LEAVE HER TO HEAVEN, ON THE RIVIERA (with Danny Kaye! ), HEAVEN CAN WAIT (with Don Ameche), and maybe WAY OF A GAUCHO, a totally B movie but it has Rory Calhoun playing a South American gaucho - what could be bad? HA! Monday, February 20th. Stay tuned!